A client of mine recently asked for support to show the next birthday for a contact. Often there will be an ask for a list view of contacts with a birthday in the next month. 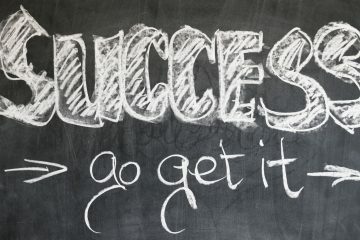 In this post I’m going to show you how to use a business rule and calculated fields to achieve this functionality without writing any code. This will be a a native calculated field so it can be used in lists, forms, queries, etc. This is not limited to birthdays, the same method use can used to calculate any anniversary date. Sale anniversaries, on-hire anniversaries, wedding anniversaries, etc. In this example I’m going to do the birthday for a contact – but this strategy can be used with any date field. The design uses all out-of-the-box configuration capabilities. 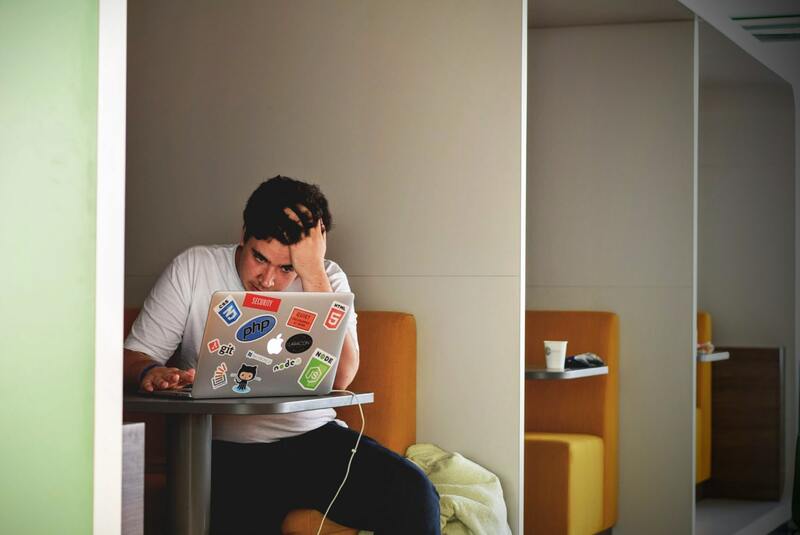 There is no code, nothing unsupported, and nothing “wacky” – just a few fields and a business rule (and a workflow if you want to update historical records.) So lets get started. For this post I’ll be working with the most recent online release. 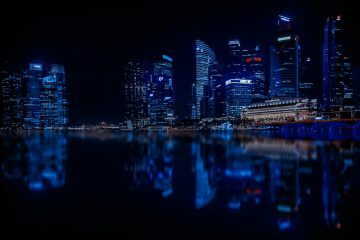 Our goal is to have a field which shows us the Next Birthday of the contact. The birthday field on the contact entity is date only. 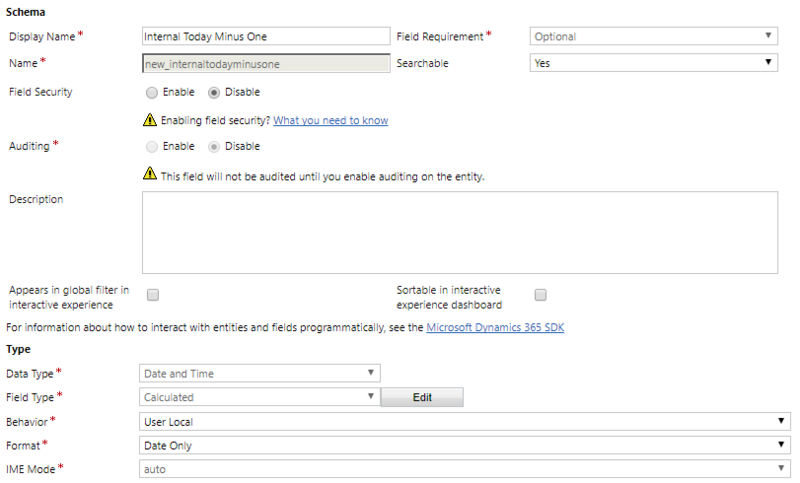 Unfortunately this means we will not be able to use the date differential calculations in a calculated field with it. The solution to this is to copy the value to a date and time field that can be used in a calculated field formula. We’ll start by creating a new field, new_internalbirthday, to hold this value. 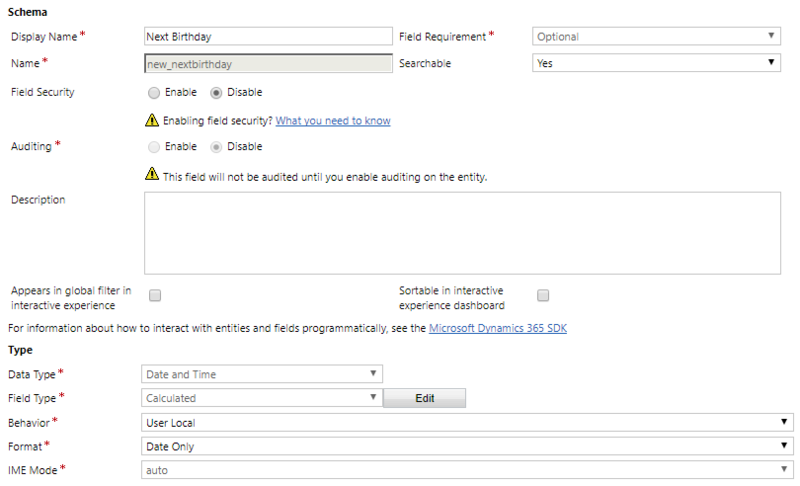 By creating a new field we allow any existing uses of birthday field to continue working – so we don’t have to change any forms, views, reports, etc. 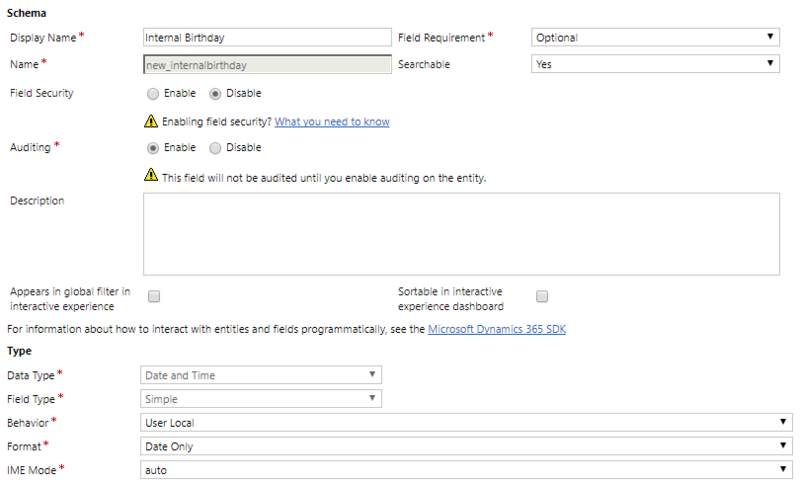 In addition, we don’t have to worry about an instance where someone (or some AppSource solution) expects birthdays to be in the birthday field, and they aren’t. Next we need to create and activate a business rule to populate the new_internalbirthday field – this rule should be scoped to Entity. This rule copies the value of birthday to new_internalbirthday, or clears it if birthday is blank. Now we can create a calculated field to get the next birthday of the contact. 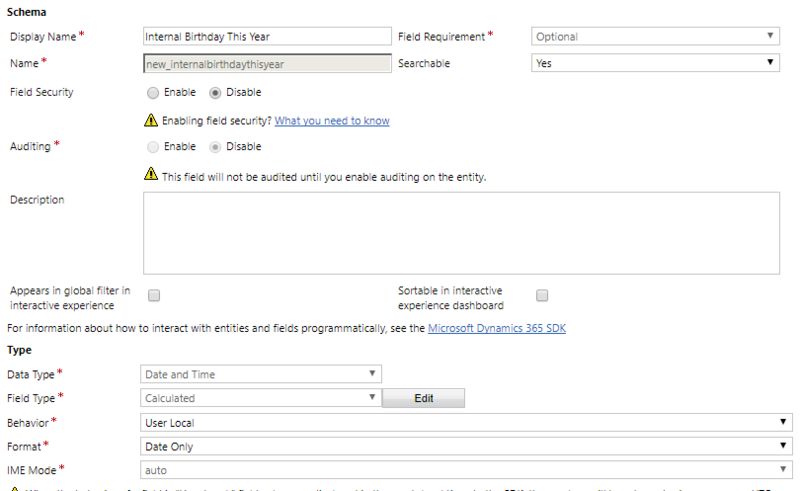 This will require an intermediate calculated field to calculate the contact’s birthday for the current calendar year. WHY? Well, because of the limited functions available for a calculated field formula we have to use two formulas to calculate the Next Birthday, depending on whether the contact’s birthday this year has already occurred. And, we need to know the birthday in the current calendar year so we can compare it to the new_internaltodayminusone field we previously created. 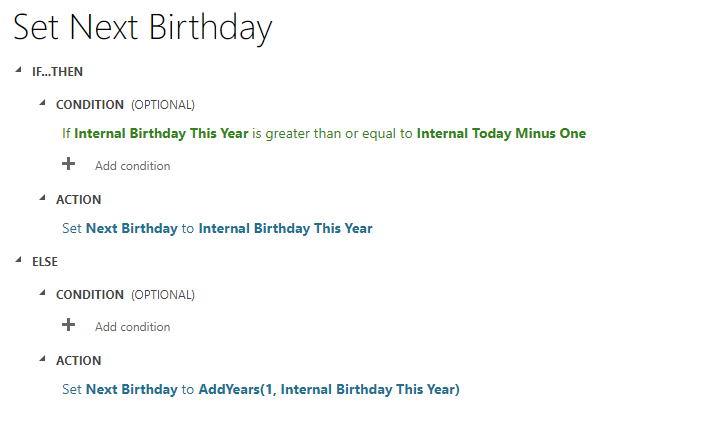 So, yes, we are creating two calculated fields (new_internaltodayminusone and new_internalbirthdaythisyear) to use in an If/Then condition to know what formula will give us the correct date for the contact’s next birthday. Go ahead and add the new_nextbirthday field to your contact form (if you want.) I also decided to rename Birthday to Birthdate, for clarity. Btw, this is also a great place to use the new_internalbirthdaythisyear field – since it doesn’t change when their birthday occurs. So if you want a list of all birthdays in the current month that’ll stay static through the month, use the new_internalbirthdaythisyear field. Warning: You can filter on new_nextbirthday in the view but you cannot sort on it. You can execute this manually, by selecting up to 250 records at a time and running it, or us the Bulk Workflow Tool plugin for XRM Toolbox. Have fun, keep making users happy, and continue to bring the awesomeness of Dynamics 365 to users everywhere!